Our last day on Kilimanjaro. We had our last hike this morning down to Mweka Gate, at 6,000 feet, where our driver would be waiting to take us back to our hotel and much-anticipated hot showers and clean clothing. For the past week on Kili, we had a plastic basin of water in which to wash our hands and faces each day, and no laundry service. 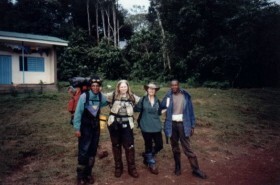 Mweka camp, like Machame camp, was small and crowded, with inadequate toilet facilities (a unisex outhouse with a hole in the floor, toilet paper to the top of the hole, and no door was the one I found and used). It appeared that all of the hikers who shared our camps on the way up the mountain made it to the top. Many people were coughing that morning, and I’m sure there’s a medical reason related to the exertion and lack of oxygen at the top to explain why. We left Mweka camp at 8:30 and had what may have been my worst hike of all. 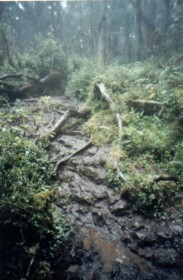 The hike took us 5 hours and 15 minutes, through a rain forest and path that was a sea of mud. At times the mud was up to a foot thick, and sucked my boots down when I tried to walk through it. My boots and gaiters were caked with mud on the outside and my feet had broken blisters on them. I had trouble staying upright. Three hours into the hike, after I’d fallen down in the mud for the sixth time, I lost it. I broke down and, in tears, told the guides to just leave me there in the mud. Faced with my despair, Joaquim realized I was having problems that day and took me by the hand and arm and led me through the mud for the final two hours of the trek, at times holding me up and dragging me along. I was grateful for his help but despite it, I still managed to fall down in the mud two more times in the last two hours of the trip. We were the last hikers to reach Machame Gate that day. The boy selling "JUST DONE IT—Kili 2000" t-shirts was about to pack up and leave, thinking no one else was going to make it down the mountain that afternoon to purchase his wares. The porters removed my mud-caked boots and gaiters and took them away to wash them. I padded around in my dirty socks. We had lunch, and the porters came over to thank us for our tips and shook our hands. 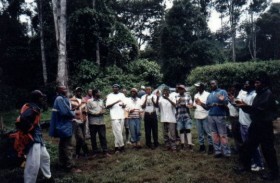 They then sang the Kilimanjaro Song for us—a tradition for climbers coming down the mountain. Afterwards, amidst tears, and surrounded by the porters, Joaquim presented us with our certificates attesting that we had successfully climbed Mount Kilimanjaro all the way to the Summit. We asked Joaquim to tell us honestly whether, when he first met us, he thought we could make it to the top. He said he can tell after the first day’s hike whether someone will make it, and after the first day he thought we would. He told the driver who was taking us back to our hotel that we were both strong women. After a few last-minute photos and thanks, we loaded up into our vehicle and headed back to Arusha and our hotel, where two showers didn’t seem like enough to feel clean.